The men of the “A” companies of the 2nd Light Infantry had been hearing odd noises for the last half hour. One of the sentries said that he too had heard the noises and all he had seen was a local farmer out early driving some cows. That seemed to explain things, but the noises persisted. Then the lead sentry to the northeast saw, in a momentary gap in the fog, the image of a line of men moving towards his position. He issued a challenge but there was no answer. He fired his gun and ran. The other sentries did likewise as the line of men–clearly identified as soldiers swept after them. Eerily quiet with only grunts and low calls, the shadow force advanced on the main line of pickets. A large force of perhaps several hundred men with bayonets lowered are bearing down on your men. What will they do? Do you wish A / 2 LT to stand for a Close Combat or would you like to retreat before Close Combat? If you retreat, you can retreat 1 or 2 hexes to rearward–just let me know which hex you would like to go to. The attackers are coming from 1733. 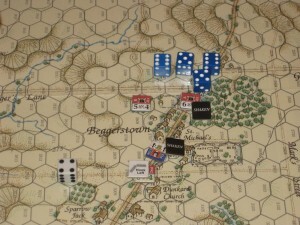 The second-person text above comes not from a Choose Your Own Adventure book or an RPG, but from a communiqué from the referee of a double-blind play-by-email (PBEM) recreation of the Battle of Germantown that has been on my upstairs game table for the better part of the last year. The game was played out using the hex and counter treatment of the battle published by Clash of Arms as part of their Battles from the Age of Reason series. As tabletop wargames go this is a fairly heavy duty system, intended for the serious enthusiast seeking to recreate the distinctive elements of 18th century blackpowder warfare—elaborate formations of column and line coupled with the ponderous maneuverings of same brought on by primitive battlefield communications—all with a high degree of fidelity. There’s one thing the system can’t recreate though, something that’s the great liability of nearly all tabletop wargaming experiences: the fog of war. Consider the ergonomic posture of a pair of gamers hovering over a map that gives them a depth of knowledge of both terrain and the dispositions of friend and foe that is perhaps only now—and still imperfectly—matched by a contemporary commander sucking down gigabytes of real-time battlespace surveillance from a swarm of drones circling overhead. 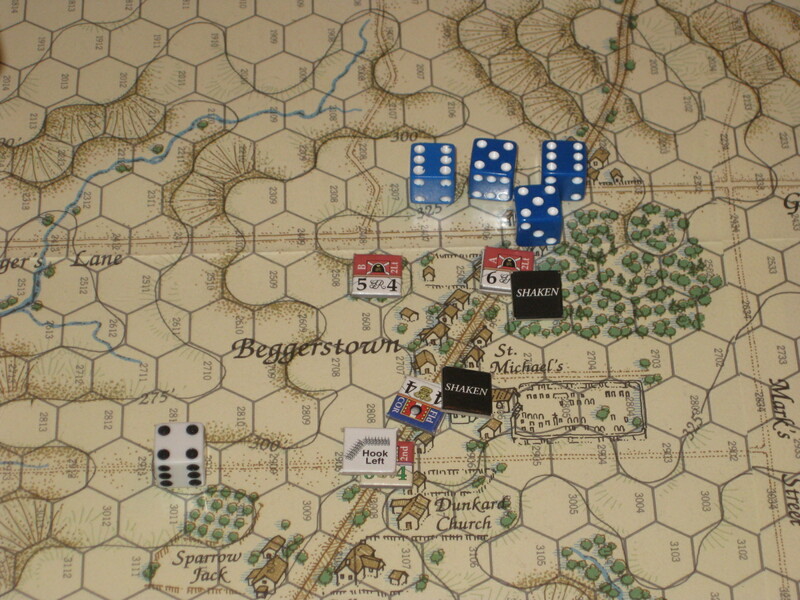 How can a tabletop game possibly recreate the chaos and limited optics of the 18th century battlefield, where a general couldn’t see further than the next hill (or the back of the neck of the taller guy standing in front of him), to say nothing of the confusion induced by noise, smoke, bayonets, cannonballs, disemboweled horses, and eviscerated men? Why do wargames, which value extreme fidelity to the minutiae of weapons systems, tactics, and troop movements so often fail reckon with the gaping discrepancy between the level of command and control players can exercise over their cardboard men as compared to their real-life counterparts? Germantown, as a subject for simulation, renders such blindspots impossible to overlook. Those of you interested in a detailed historical account of the actual battle can go here, but suffice to say that it was an attack by the main body of Washington’s Continental army on the British cantonments outside of Philadelphia after His Majesty’s forces, under Lord Howe, occupied the rebel capital in 1777. Washington planned to have as many as four columns of troops converging on the unsuspecting British encampment from as many different points of the compass—a tricky exercise under the best of conditions, but the morning of the historical battle the area was blanketed by a dense fog. Had Washington succeeded, he could have turned the tide of the war, quite possibly prompting a British withdrawal from the colonies. But in the confused melee that followed his plans came apart and, despite some initial success, the American attack was ultimately beaten off by the redcoats who rallied from their tents. Before such systems, PBEM was literally that, with players swapping moves back and forth using written notation in email—a practice that harkens back to an even earlier era of playing wargames by post, with sometimes weeks elapsing between a single move–even a simple game could take years to finish. 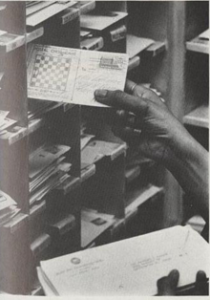 This in turn, of course, is but an extension of long traditions of playing chess, backgammon, and other games through the mail, in turn made possible through standardized notation systems. (Think of Jack Gladney’s son Heinrich in DeLillo’s White Noise playing chess by mail with a convict on death row . . .) The term “tabletop” gaming thus in fact encompasses wider area networks of distributed, often asynchronous play, leveraging written conventions and the prevailing communications technologies of the day. For our Germantown battle we had some twenty players, roughly ten on each side, and one Game Master, the incomparable Mathew Hinkle. Each player was responsible for control over just a handful of units—I had a few regiments of light foot comprising the British pickets—and we submitted our moves and orders every ten days using a set notation. Each side also had brigade or wing commanders, as well as an overall commander in chief—Washington or Lord Howe. Aides could be dispatched with brief written memos to one’s compatriots, but they took time to traverse the battlefield and were vulnerable to going astray, getting lost and adding even more time to their travels, or being killed along the way, or—worst of all—being captured and having their dispatches fall into enemy hands! Both armies were also allowed a pre-game conference, wherein initial plans were drawn up. But then as now it is a truism that no plan survives contact with the enemy, and between reacting to immediate threats and the confusion induced by the ever-present fog the plans of both armies soon unraveled. Mathew Hinkle, in addition to refereeing the game at a mechanical level and adjudicating die rolls, also supplied much of the narrative flavor in a constant flow of communiqués written in period language. Players, of course, also got into the spirit, and the result was a large, distributed archive of the game fiction (to borrow Jason Rhody’s term) which is only now being pieced together on a discussion board as players engage in a collective turn by turn after action report, posting the perspectives from their individual commands. For me, especially since I was lucky to be playing one of the key roles in the battle, the experience was a long narrative thread that often unwound in the back of my mind as I pondered the fate of my fragile picket line in those fog-shrouded fields around Germantown. I kept track of my own game state using my individual copy of the game, and I used dice to indicate my rough sense of local enemy dispositions—I could discern the size, formation, and position of a nearby enemy force, but not its identity. Only after a successful engagement might I learn that the enemy I had faced was actually, say, the 7th Virginia. So here we have an unusually extended, distributed, and engaging playing of the past. But is anything about the experience worth taking away beyond a very detailed what-if account of the Battle of Germantown? I think the social and material circumstances of the game are worth some comment. First, this was an unusually large and long-running hobby wargame project, undertaken by a group of over 20 players over a period of some eight months. (That said, there have been even bigger PBEM games—massive naval battles, for example, with each player controlling a single ship of the line.) Having only a few units under one’s direct control served as a powerful narrative focalizer, the temptation to embellish and amplify routine game functions with a fictional veneer all but irresistible—the experience was at least half-way to role-playing. Participation required not only a healthy attention span and the ability to remain in the spirit of things for a long stretch of time, but also willingness to contribute to the collective story of the battle. To this day we do not know who won, as Mathew H. is only going to reveal the outcome at the conclusion of the collective AAR—still several weeks away. So the game was and is an intensely social and communal experience. It was also a hybrid one, which would have been possible neither solely online nor with the tabletop incarnation of the game. Our playing of Germantown is also thus a remediation in the manner in which Sebastian Deterding sees as paradigmatic for understanding the relation between board and computer gaming. The narrative that is emerging—as rich and detailed as any historical account of the battle—is informed by the rules of the game, by chance outcomes related to combat or the disorientation of the fog, and by the spontaneous, unsolicited flavor texts of the sort written by both GM and players. There will be no one definitive account, but those interested can peruse this dense thicket of counter-factuals—many of which bear a remarkable resemblance to the historical battle, such as the stout defense of the mansion at Cliveden by the British 40th, the same regiment of foot that held the house historically—and attempt their own summation of the players’ postings. Ultimately, for me, playing through the past of this foggy morning outside of Philadelphia expanded my sense of the possibility space of tabletop gaming, disrupting its default oppositional posture (two opponents squaring off), as well as its implicit retro contrast to the digital gaming (here online networks are an integral element of game play). There is the same satisfaction that comes from finishing a long novel, or achieving a milestone in personal training. A sense of something accomplished, something that could not be rushed, or streamlined, or a process that could not be further rationalized. The game now seems curiously close to reenactment, even as it eschews the real-time pacing and scratchy wool uniforms. For eight months these were “my” troops and the game was my history. It speaks, I think, to our desires for immersion in simulation, and also to what A.S. Byatt, in a rather different context, once called possession. See Deterding’s “Living Room Wars: Remediation, Boardgames, and the Early History of Video Wargaming” in Joystick Soldiers: The Politics of Play in Military Videogamees, eds. Nina B. Huntemann and Matthew Thomas Payne (New York and London: Routledge, 2010): 21-38. This is an excellent survey essay. An insightful post, Matt (sorry for the pun). It raises two questions for me. First is the oft discussed “ineffability” of war taken on in texts such as The Things They Carried. In that text O’Brien circles around a “truth” of his experience in Vietnam, drawing close to it but ultimately pulling away or willfully drifting into self-contradictory fictionalizations. The “truth” that O’Brien finally comes to is that war cannot be represented, though it has a gravity which prevents his pseudo-autobiographical narrator from escaping its effects (affect). Your final paragraph suggest for me an affective relationship that is perhaps surprising given that the representation in this case is a game (though I think you would prefer “simulation”). Two questions then: 1) is the affect of a simulation comparable to that of narrative (either fictionalized or biographical)? And 2) with the attention to fidelity that define games/simulations such as The Battle of Germantown, could we argue that games are better able to represent war than narrative? Or perhaps more productively, what truths do games/simulations arrive at that may differ from the truths arrived at in a text like The Things They Carried? Secondly, I’m intrigued by the color text and wonder if it too could function as a “fog of war” as it opens the possibility for misreading, just as a soldier/general might misread data on the battlefield. I’ve recently finished running my own class through a week-long RPG/free Kriegsspiel on peace operations, and much of the “fog or war” (or peace) is deliberately built into what passes for flavour text: ambiguous statements, exaggerated reports, information embedded in different narratives that only becomes actionable when they are collectively analyzed, etc. Moreover, since I’ve run the same week-long fictional civil war simulation for more than a decade now, often with the same cues and miscues buried in the information flows, it has all become a rather interesting–if entirely unscientific–experiment as to what particular configurations of 1) institutional structures, 2) idiosyncratic factors, and 3) situational and contextual variables shape tactical, operational, and policy responses. That’s not to say representations are perfect, or even (necessarily) that realism, as a narrative mode, is the same as thing as something being realistic. One WWII veteran famously remarked that Saving Private Ryan could be made a good deal more “realistic” by randomly firing into the audience. Simulations are selective representations. That is to say, they choose some aspect of an event and isolate it for purposes of study. Not all aspects of the event receive equal treatment. Increasing detail and complexity does not necessarily increase the fidelity of the simulation. A simulation can be abstract as well as detailed. Here’s a simulation of the Battle of the Bulge: roll a six sided die, 1-5 the allies win, 6 the Germans get a tie. It’s not very interesting, but that’s beside the point. And it does teach something about the strategic context for the Bulge. In my case here, I would argue strongly that what you (rightly) perceive as the affect of the event is a product of its collective, communal nature and its extended duration. Likewise, the role playing tendencies I remarked upon do wonders for the narrative qualities. Rather than seeing games and narrative as alternatives, I prefer Jason Rhody’s “game fiction.” Maybe if he has a Google Alert set up we can get him to weigh in here. Finally, excellent point about the color/flavor text. In fact, those misreadings happened in the game. Anyone know of any ludology work on flavor text in RPGs or tabletop games more generally? Again, Jason R. is about the only person in the room here I think.